Queen Rania describes 'Operation Smile' as a group that is changing the face of the world. (Office of Her Majesty, Press Department - Amman) Her Majesty Queen Rania Al-Abdullah commended the work of doctors and volunteers who seek to put a smile on the faces of children by operating on those suffering from facial deformities as part of Operation Smile programs worldwide. 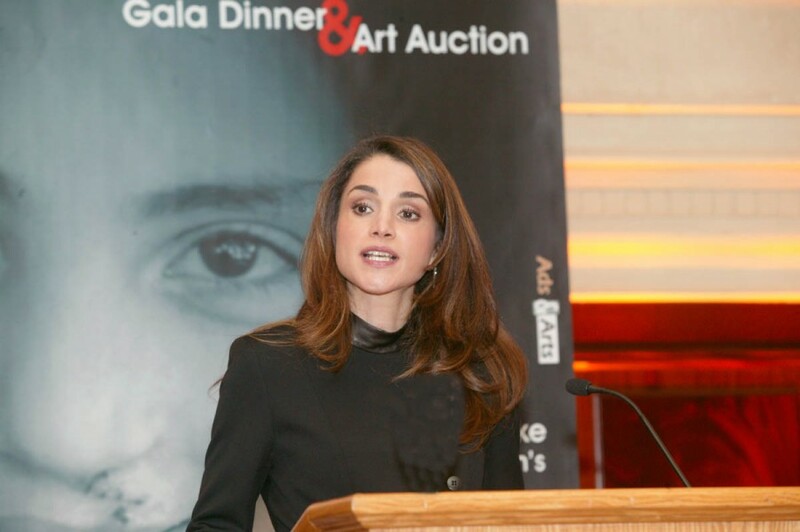 Queen Rania’s remarks came during the fundraising gala dinner held under the Her Majesty’s Patronage, which also included an art auction, showcasing the work of many Jordanian artists who donated their work to Operation Smile Jordan to raise funds to cover the cost of the medical mission. 153 children underwent reconstructive surgery this year, free of charge, to treat facial deformities, ranging from cleft lip and cleft palate and burns. “For children with facial impairments, the physical risks are not life-threatening, but the emotional damage is ... A facial deformity can brand a child as an outcast … The painful scars of this hidden wound may never truly heal,” Queen Rania told the gathering, sponsored by private sector companies, and attended by a number of dignitaries including Chairman of the Board of Operation Smile Thomas Kane, OSJ board members, US Ambassador to Jordan Edward Gnehm among others. “We’re very proud to be opening a Jordanian chapter of Operation Smile. It will serve not only Jordan’s children, but children throughout the region ... There are hundreds of languages in the world, but a smile speaks them all,” Queen Rania noted. Queen Rania, who has provided her support and guidance to the organization and accepted the post of Honorary Chairperson of Operation Smile Jordan, underlined appreciation for Operation Smile endeavors, saying since the first mission here, three years ago, they have touched the lives of 300 young Jordanians and their families. “Throughout their different missions around the world, we see the emergence of vibrant networks of care, compassion and common values… networks focused on the public good as well as personal fulfillment,” Queen Rania noted, referring to the fact that local doctors and medical specialists join the international teams, receiving training in new techniques to perform the procedures themselves. In an effort to bring a smile to hundreds of Jordanian children, Operation Smile Jordan (OSJ) held this year's mission at Princess Basma Hospital in Irbid, December 11-21, expanding its reach to benefit children beyond Amman, with 50 medical volunteers from around the world traveling to Jordan to operate on children suffering from facial deformities. As part of the Kingdom’s endeavors to provide humanitarian assistance to the Iraqi people, fifteen kids were also brought in from Iraq. Queen Rania has been actively working towards providing vital humanitarian assistance to the children and people of Iraq and facilitating the work of NGOs working to ease the suffering of the Iraqi people. In her capacity as chairperson of the Advisory Council of the STARS Foundation, in October Queen Rania presented, on behalf of foundation, a donation of to the International Medical Corps (IMC) to help treat Iraqi children suffering from the most serious cases of cancer. Funds were raised during the STARS Foundation gala dinner at the World Economic Forum's Extraordinary Annual Meeting, at the Dead Sea on June 22, 2003. A group of young Iraqi cancer patients is already receiving treatment at the King Hussein Cancer Center. OSJ operates under the umbrella of the Operation Smile, Inc. with its humanitarian work helping children in 21 countries since 1982 by correcting their disfigurements through the gift of medicine and surgery – a change that brings about a more normal, positive life, and healthier self-image for once disfigured children. OSJ is a private, not-for-profit, volunteer medical service organization providing reconstructive surgery, and related medical and dental treatment, free of charge, to children in Jordan. It has been working locally as the community development component of JABA, the American Chamber of Commerce in Jordan. During the last three years, OSJ has completed three successful missions at Al-Bashir Hospital, treating more than 300 children.